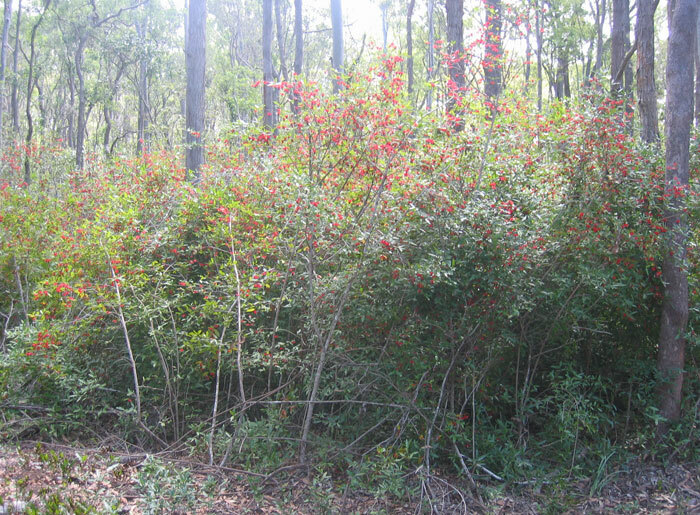 An escapee from local gardens, the Mickey Mouse Plant (Ochna serrulata) quickly becomes an invasive plant that takes over bushland. The open sepals of the Mickey Mouse Plant showing darkening drupes that will carry its seeds far and wide. Close-up of the Mickey Mouse Plant showing darkening drupes that are so attractive to birds and other wildlife. Those residents who live near – or enjoy exploring – the bushland in the Dawn Road Reserve may have noticed the distinctive Mickey Mouse Plant (Ochna serrulata). Its tell-tale green, glossy leaves with serrated margins plus its bright red stalks that carry berry-like ‘drupes’ – which turn from green to black – are not only eye-catching, but also a magnet for hungry birdlife. 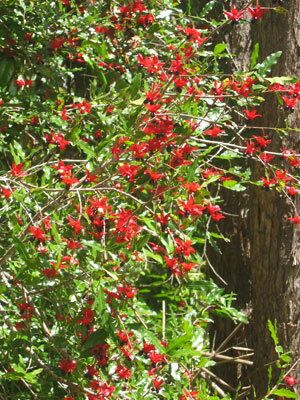 Interestingly, its red blooms are not flowers, but sepals (receptacles for its oval-shaped drupes). Its flowers are small, bright yellow and short-lived. However, what sets this persistent, invasive weed apart from other pest species is its sheer resilience. This plant, a native of Africa and initially an escapee from the district’s gardens, is remarkable in the ways it can survive all manner of interventions that would stop other plants in their tracks. It can also thrive in the harshest of conditions. Firstly, in the Reserve’s mostly clay soil, it sends down a strong root that then hooks sideways, making it difficult to pull out unless it’s still an immature plant (less than about 15cm tall) and the ground is sufficiently moist. Then it has the ability to reshoot, with multiple stems, if it has been snapped off either above ground or below ground somewhere on its root system. It is unfazed by fire, flood or drought and any of its seed-bearing drupes not eaten by birds or other wildlife will drop to the ground around its base or be spread in the immediate vicinity by wind or other disturbances. Its sepals carry up to six individual seed-bearing drupes. Once dispersed, these seeds will sprout without any intervention or nourishment, even germinating in shady spots. Very soon the parent plant is surrounded by a dense thicket of offspring that have grown to take over an area, crowding out native species and out-competing even the hardiest local plants for space, water, light and nutrients. The really bad news is that Ochna serrulata is not at all easy to eradicate, say experts, because even aerial spraying will not always kill off this incredibly hardy plant. Left to its own devices, this invasive species will quickly form an impenetrable thicket, out-competing other plants in the Dawn Road Reserve. 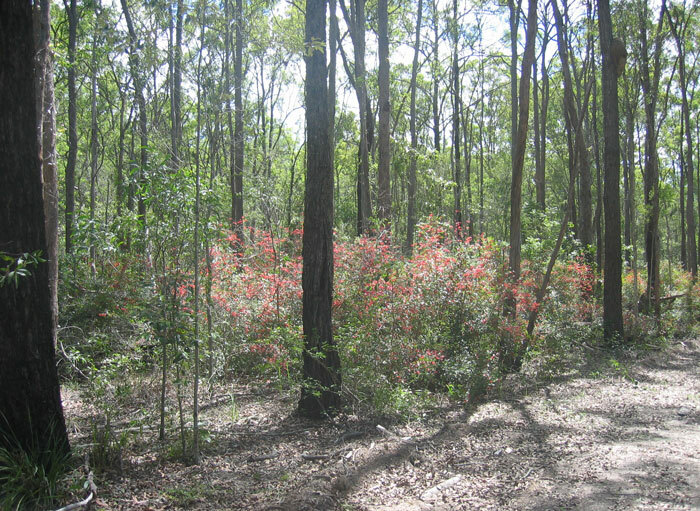 In the past, the Moreton Bay Regional Council has contracted a specialist weed control firm to treat the heaviest of the Reserve’s infestations but much of the follow up and ongoing eradication of this pest species has fallen to the Dawn Road Reserve Bushcare group. 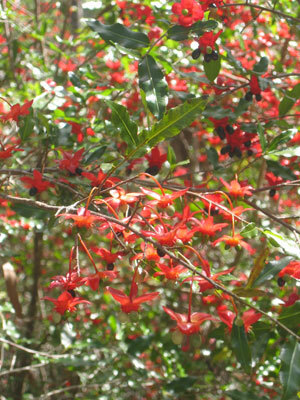 And it requires specialised treatment of individual plants by trained Bushcare volunteers. No matter which patch the group works on around the Reserve, there is always evidence of some Ochna serrulata which, left unchecked, will spread out and dominate what are currently biodiverse areas. What is especially worrying for those of us interested in the Dawn Road Reserve, is that local, interstate and international horticultural experts agree Ochna serrulata is terribly invasive. So it takes many hands to keep it in check.